Insti­tu­tional Advancement hired two recent Hillsdale College grad­uates to assist in fundraising, event planning, and donor rela­tions. Fol­lowing their grad­u­ation in the spring, Nathan Lehman ’18 and Danny Drummond ’18 began working as Insti­tu­tional Advancement asso­ciates. The recent hires will form rela­tion­ships with Hillsdale College sup­porters and work to secure funds to help the college thrive and expand. Insti­tu­tional Advancement is the college’s fundraising and out­reach department. According to Senior Advancement Officer Calvin Stockdale ’10, it serves as “the outward-focused voice and face of the college to larger, more sig­nif­icant donors.” To sup­plement the college’s mar­keting strategies, the department aims to build long-term, genuine rela­tion­ships with those that give to Hillsdale. “It’s a per­sonal touch,” he said. Lehman, who studied pol­itics and eco­nomics, knew he wanted to go into fundraising and devel­opment after grad­u­ation. 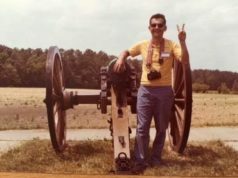 As a student, he worked for two years in the Planned Giving department, where he developed a knack and passion for con­necting with the college’s sup­porters. A chance and encour­aging encounter with Hillsdale College Pres­ident Larry Arnn prompted him to submit a cover letter and resume to Vice Pres­ident of Insti­tu­tional Advancement John Cervini, and he was soon hired. 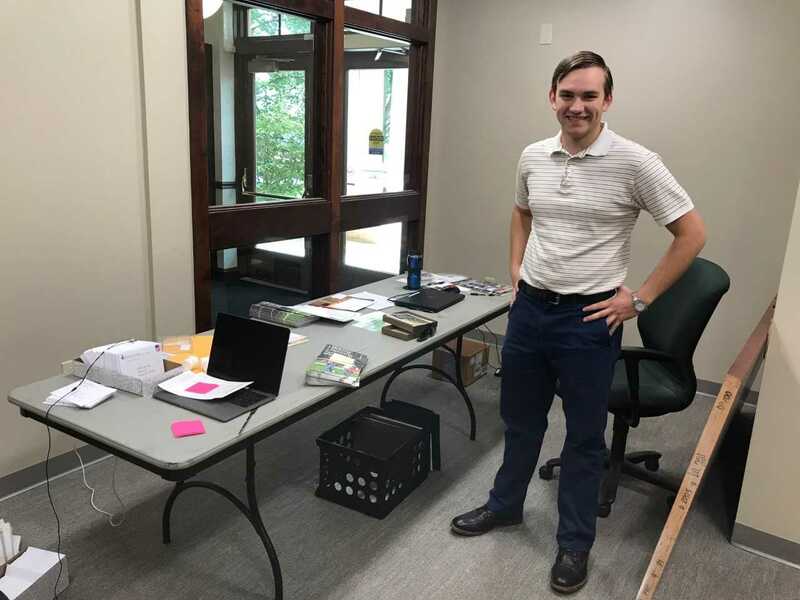 Drummond, who majored in mar­keting and history, was inspired to work for the college after hearing Arnn speak about Hillsdale’s plans for future expansion at a Parents’ Weekend event last spring. A firm believer in Hillsdale’s mission, Drummond realized that he would like to con­tinue to be a part of part of the college as it grows in size and influence. After getting in touch with Arnn and Cervini, it became clear that he would be a perfect fit for the department. “I’m so very happy to come back,” he remarked. Insti­tu­tional Advancement con­nects with college sup­porters indi­vid­ually in their home­towns, through events on campus and at events throughout the country. Lehman works a portion of the Midwest, while Drummond is appointed to the Plains states. They travel reg­u­larly throughout their ter­ri­tories to meet with sup­porters and assist with events. They also host and give tours to college sup­porters who visit campus. The majority of their time is spent preparing for, exe­cuting, and fol­lowing up on meetings and events. Meeting with college sup­porters allows Insti­tu­tional Advancement officers to thank them for their gen­erosity and update them on campus devel­op­ments. “We are essen­tially taking a little piece of Hillsdale to them,” Stockdale said. Stockdale, Lehman, and Drummond agree that this is imper­ative, given that many of Hillsdale’s sup­porters have never visited or oth­erwise had contact with the college. It also gives them the oppor­tunity to determine college sup­porters’ spe­cific interests within the college, and identify how they could grow in their giving rela­tion­ships by con­tributing directly to those areas. Lehman said he has found that working with college sup­porters to for­mulate their best giving strategies is similar to helping stu­dents find their niche on campus. “The way I see it is we’re trying to help people realize their indi­vidual dreams here,” he said. Insti­tu­tional Advancement orga­nizes a bevy of events nationwide, including Lifelong Learning Sem­inars, National Lead­ership Sem­inars, Arnn Recep­tions, Hometown Lun­cheons, and Freedom Forums. The department also pro­vides sup­ple­mentary activ­ities for those attending Center for Con­structive Alter­na­tives sem­inars. Insti­tu­tional Advancement officers help run the events, and connect with college sup­porters and other attendees. Lehman and Drummond appre­ciate that they are rep­re­sen­ta­tives of Hillsdale’s ethos and purpose. “I’m an ambas­sador for the college to the world. I’m always ready to talk about it,” Lehman said. Drummond shares a similar view. They agree the best part of their job is meeting a variety of quality and intriguing people. “I love getting to know new people and hearing their stories,” Lehman said, remarking that college sup­porters are diverse in interests and back­grounds. 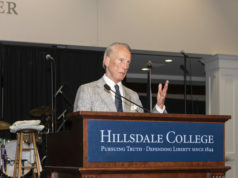 Drummond speaks highly of Hillsdale College’s sup­porters. He stressed that stu­dents are at the heart of Insti­tu­tional Advancement’s work. “What we’re doing in Moss has a direct effect on the stu­dents,” Drummond said. 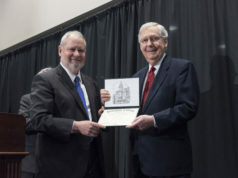 He explained that donors’ gen­erosity enables many stu­dents to attend Hillsdale College, as their con­tri­bu­tions allow the college to trim tuition costs and provide schol­ar­ships and financial aid. Lehman agreed that their work is about the stu­dents. Both asso­ciates have found the tran­sition from their roles as stu­dents to employees of the college sur­pris­ingly seamless. They enjoy keeping up with friends on campus and value the oppor­tunity to apply their com­mitment to all that the college stands for pro­fes­sionally.